Through self-reflection and admissions of struggle, this memoir’s inspirational prose elevates the pursuit of the global good. 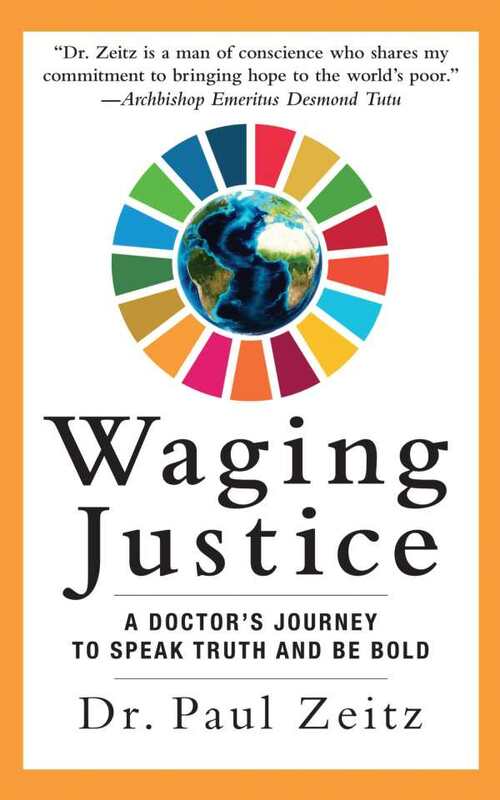 Paul Zeitz’s memoir Waging Justice is about his career in epidemiology and lifetime pursuit of social and moral justice for the impoverished people of the world. Beginning with Zeitz’s childhood, including tumultuous interactions with his family, the book progresses to his education as a physician and epidemiologist. It includes accounts of Zeitz meeting his wife and his early years of work, spent having children and moving around the world. A prominent theme is using spirituality to combat despair in seemingly hopeless situations, like the HIV/AIDS epidemic in African countries.The important balance of one’s mission on Earth and the demands and joys of having a family is also covered and seems achieved, despite the substantial monetary and emotional pressure it placed upon him. Zeitz’s is a self-revelatory text, acknowledging experiences of racism, despair, and anger and examining how he worked to avoid those things in interactions with others. His stories of global development work, which include both frustrations with bureaucracy and successes like helping to open an orphanage in Zambia, are informative and detailed. Even sections on complex policy initiatives, including the Global AIDS Alliance, are clear. Most emotional in the story are moments in which Zeitz copes with the deaths of close friends and family members, often showing great reserve in his expressions of loss. His candor about how global development work can strain a marriage is valuable as well. In such moments, the memoir distinguishes itself from similar accounts that only talk about the high points of such work. Through it all, the idea that overwhelming odds must be met with overwhelming willpower emerges. The pace is steady. The book neither lingers on unnecessary details nor rushes through important moments; instead, it zooms in on the moments and days that made the most impact on Zeitz’s life, glossing over the months and years in between those days. Moments of exact dialogue, especially with development leaders and those Zeitz admires, are incorporated fluidly and just often enough to add a narrative quality to the text. Italicized rhetorical questions convey Zeitz’s inner monologue, revealing a man constantly searching for the next best choice. The resolution of the text is a poignant account of grief and hope, culminating with a successful UN vote on sustainable development goals. As with much of the book, it balances difficulties with joy, capping the engaging and thoughtful text. Waging Justice is a memoir that spans a spirited, exciting career in service. Through self-reflection and admissions of struggle, its inspirational prose elevates the pursuit of the global good.